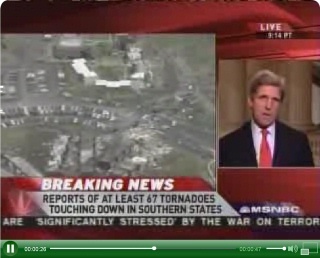 Kerry Blames Tornado Outbreak on Global Warming | Watts Up With That? Kerry appeared on MSNBC on February 6 to discuss storms that have killed at least 50 people throughout the Southeastern United States. So, of course, Kerry used the platform to advance global warming alarmism. Hate to break this to you John, but its got nothing at all to do with “global warming” and everything to do with La Nina. Mr. Kerry, stick to politics and swiftboats please. Joe D’Aleo on ICECAP has a review of the Kerry blunder and includes references to studies linking tornado outbreaks to previous La Nina years. As tornado season gets into full swing, be prepared for more nonsensical utterances from misinformed politicians and celebrities. Oh wait, its an election year, so double that. February 7, 2008 in Politics. This is what happens when you put stupid people in front of a microphone…. I wonder if true believers like Tamino cringe when they see stuff like this or whether they embrace it. REPLY: There’s no graph coming out of Kerry’s mouth so it’s invisible to him. Kerry doesn’t know the “other side” has the ACE up its sleeve. If the above looks weird, it’s because I am still thrashing around with Laocoon and the tags. But does Kerry know the “other side” has the ACE up its sleeve? Perhaps Matt’s contribution serves example of “the real problem” with the AGW debate? REPLY: Yes, I’m considering a post named “headlines” as an instructive excercise. January 1999 bore swarms of tornadoes in the same area, though not as many deaths, probably because those occurred during the daytime. I think this was more along the LaNina cycle. Ralph, you really can’t make this stuff up, can you? I just love to read the comics. Unfortunately some of these comics are the movers and shakers. Don’t ya just love it. Anthony, OT question has Steve M shut down climate audit while he is outof town? For some reason I can’t access it this afternoon. Andrew: Thx for the links. Hey John, when you get around to it, could you please look into your crystal ball and explain to me why it’s been snowing here in Idaho for the past three weeks–and why it’s been below zero since Christmas in Minnesota? I’d like to serve Sen. Kerry with a nice piping-hot mug of STFU. C’mon over to my cabin–if you can get to it through the seven feet of freshly-fallen snow. Morons with money and power are still morons. REPLY: Please no flaming here. The point is that single or a short string of weather events are just that, weather. A 30 year shift in the PDO like we saw in 1977 is climate. Kerry made the mistake of citing a weather event being caused by “climate change” instead of the real cause, La Nina. Don’t make the same mistake in reverse. That said, thanks for visiting, feel free to comment but tone it down a little. Suzuki? Really? Wow. He wrote one of my textbooks in college. You never expect it will be the people who were supposed to have taught you science. Wow — you’re really smart AND you don’t like Kerry. What a great combination. 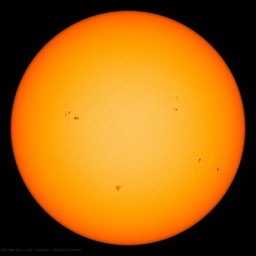 Pingback: AMS Linking Weather Events to Climate Change « Watts Up With That?